Here we are with another installment of “365 Things to do in Cincinnati” and today we’re featuring a local brewery – Fifty West Brewing Company. We have this thing going with some friends of ours and it involves hanging out at all the new breweries that are popping up all over town. It may not be the best hobby to adopt but we’re currently loving it! Our latest stop was at Fifty West Brewing Company. Fifty West sits on Route 50 (in Newtown) in the spot that was The Heritage Restaurant for years and years (since the early 1800’s). When you walk in the door, you immediately realize you’re in for something special. They’ve managed to keep many of the architectural elements that must be original to the building like the beams in the ceiling and a wall that was once burned in a building fire (now covered with protective film). They managed to blend the historic and original feel with some gorgeous, more modern tile and earthen stacked stone plus some serious stainless… all to make a VERY attractive space in which to enjoy a brewed on-site beer. You’ll have to excuse what turned out to be pretty rotten pictures folks. The place was packed and I try not to make people feel uncomfortable when I am taking pictures – thus a lot of less-than-ideal clarity in my shots. The guys that own Fifty West put a LOT of thought into everything they do. There is meaning behind so many of the business elements – everything – not just the brew. The name, for instance, is Fifty West Brewing Company. You’ve probably associated that with their address by now – Route 50. But did you know that Route 50 goes all the way out to the west coast… hence the name Fifty West. The business embraces that “Go West Young Man” philosophy in all that they do. They’re full of adventure and the thrill of what lies ahead. Beers are named for a different road trip you might take out 50 West. The van you might see them using to deliver their brew is the ultimate road trip bus – an orange VW bus circa 1978. We were lucky enough to get to go behind the scenes for a short tour with one of the owners, Bobby. He explained to us that their beer is small batch brewed using the 4 virtues they have prominently displayed in the brewery: patience, tradition, innovation, and craftsmanship. I told you these guys are extremely philosophical when it comes to their business! And they make some mighty fine brew I should add! We had a few flights and taste tested a number of beers. My favorite of the night was “Robinson’s Circus”, a German Style Wheat Beer which had a very mild creamy banana flavor. It sounds strange but it was so good. If you want to see more about their beers visit their Beers Page. 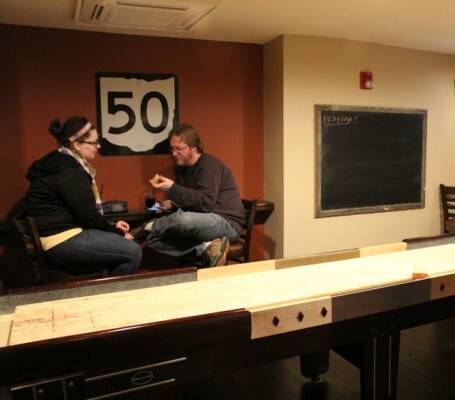 Fifty West has the main tap room, a shuffleboard game, plenty of table space, etc. (see pics above). There’s a charming outdoor patio that I’m sure will be THE place to hang when the weather warms up. They serve beer of course and they also offer food pairings (which is a welcomed addition for a local brewery) – see the menu here.